Technologies such as stability control, speed assistance and intelligent emergency braking are helping to make that morning commute a safer experience for all involved. While engineers continue to tinker away, we take a look at some of the neatest safety technology modern cars are fitted with. Keeping to the speed limit used to be a matter of watching for the next bright orange octagonal sign, but with intelligent speed assist (ISA) you have a gadget to do that for you. ISA is built into most GPS navigation devices these days, and works by comparing location information with a digital map that contains speed limits for roads and locations. Some GPS devices have an alarm setting that will let you know if you’re overstepping the limit. Research by the TAC and MUARC estimated that ISA can reduce fatal and serious injury crashes by up to 8%. And if you’re concerned about the maddening robotic tone of the sat nav lady, fear not – there are a whole host of voices you can download to accompany on your next journey. Homer Simpson, anyone? Though we tell ourselves we’d have a lightning fast reaction time in an auto emergency, the simple fact is that sometimes our minds are idle. This is where autonomous emergency breaking (AEB) comes into play. These systems, featured in the Volkswagen Golf and a host of other 5-star safety rated vehicles, use a combination of radar, lidar or video recognition technologies to measure the distance between vehicles, warn drivers if they are too close and activate automatic emergency braking if the driver fails to respond. Once the driver places their foot on the brake, EAB can moderate the pressure so that the vehicle stops within the required distance. A recent study suggested that if all cars feature AEB systems, accidents could be reduced by up to 27%, saving a whopping 8,000 lives a year. Single or dual front airbags used to be the norm, but nowadays a car must be fitted with dual frontal, side, chest and head airbags to receive the ANCAP 5 star safety rating like the Hyundai Santa Fe or the Ford Fiesta. Front airbags deploy in head on or angled collisions, where the speed of impact is greater than 25km/h, and protect the driver and side passenger from the forward propulsion. Side airbags are a new innovation that protect both front and back passengers from a side-on collision, and may even be deployed when the car is rolling. 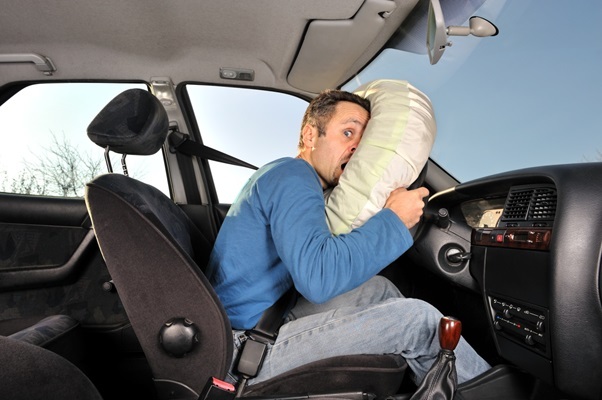 Head airbags (known as curtains) inflate to protect the head and sides of passengers and driver, particularly from protruding objects like a pole or tree, whilst knee airbags protect against impact with the dashboard or steering column. Technological innovation in hands-free smart phone control systems means that drivers are able to take a call, dial out and even send texts through voice recognition software. Road safety for drivers and pedestrians is massively improved upon when drivers are making minimal physical contact with mobile devices by reducing distraction. It is now illegal in all Australian states and territories to use a mobile while driving so this technology was developed at just the right time. As tempting as it might be to take that call from your pocket – you, and your passengers, are far better off investing in a hands free control system. Electronic stability control (ESC) helps drivers regain control of a skidding car. The smart technology, fitted in the Ford Kuga and other new models, activates when drivers lose control of a vehicle, hitting the brakes on the required tyre to put the vehicle back on the right path. A system of intelligent sensors prevents your vehicle from fishtailing and spiralling out of control. ESC is helpful for over or understeering, stabilising during sudden evasive manoeuvres and enhancing handling on gravel patches and icy terrain. What do you think will be the next big thing in car safety technology?